We have a range of set dinner party menus minimum of 12 persons - set menus are priced at 20 persons upwards. If your dinner party is in your home then we are quite happy to use any of your glassware or china if you would prefer us to do so but we do supply all that would be necessary in the per head costings. 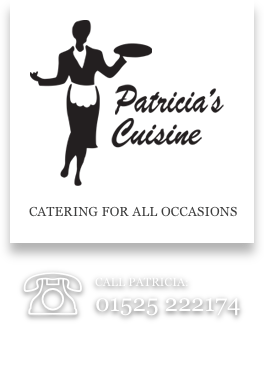 Patricia is more than happy to visit you to discuss your requirements. All inclusive of crockery, cutlery, glassware, linen and staffing. Prices are for 20 persons upwards, please enquire regarding surcharge for lower numbers.